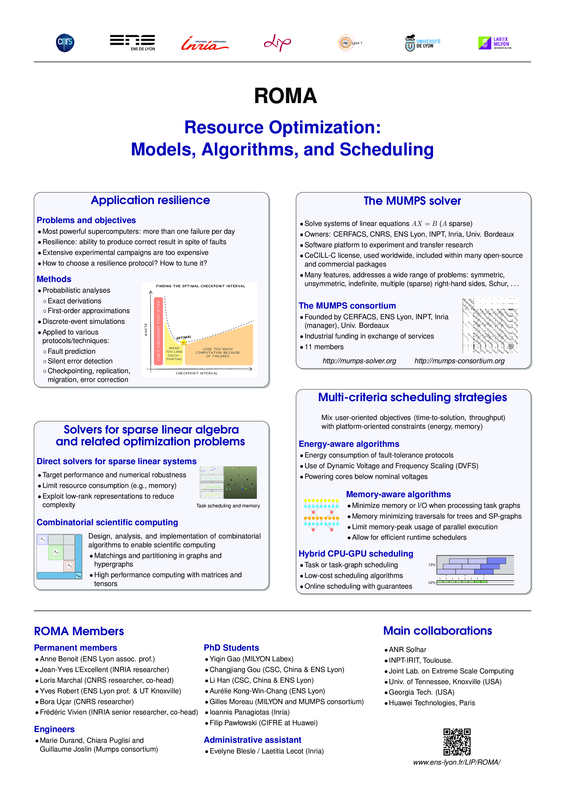 The ROMA team aims at designing models, algorithms, and scheduling strategies to optimize the execution of scientific applications on High-Performance Computing platforms. More specifically, ROMA is interested in obtaining the “best” possible performance from the point of view of the user (e.g., application execution time) while using ressources as efficiently as possible (e.g., low energy consumption). The work performed by ROMA ranges from theoretical studies to the development of software used daily in the academic and industrial worlds. The ROMA team is devoted to the study of the fault tolerance, the energy consumption, and the memory usage of scientific computing applications executed on clusters and on supercomputers, with a special interest in direct solvers for sparse linear systems. The work of the Roma team will be organized along the three following research themes. Resilience. In this theme, we focus on the efficient execution of applications on failure-prone platforms. Here, we typically address questions such as: Given a platform and an application, which fault-tolerance protocols should be used, when, and with which parameters? Related to this problematic, is the optimization of the execution of applications whose behavior is described through some probability distributions: in both contexts, optimization problems must be solved in probabilistic settings. Multi-criteria scheduling strategies. In this theme, we focus on the design of scheduling strategies that finely take into account some platform characteristics beyond the most classical ones, namely the computing speed of processors and accelerators, and the communication bandwidth of network links. In the scope of this theme, when designing scheduling strategies, we focus either on the energy consumption of applications or on their memory behavior. All optimization problems under study are multi-criteria. Solvers for sparse linear algebra and related optimization problems. In this theme, we work on most aspects of direct multifrontal solvers for linear systems, usually in the scope of the MUMPS solver that we co-develop. We also work on combinatorial scientific computing, that is, on the design of combinatorial algorithms and tools to solve combinatorial problems, such as those encountered, for instance, in the preprocessing phases of solvers of sparse linear systems. In addition, we also work on dense linear algebra: we focus on the adaptation of factorization kernels to emerging and future platforms. The ROMA team is one of the two teams that replaced the former GRAAL team.